Introduction. Scope of the study. Structure of the book. Limitations of the study. Project organisation and acknowledgements. The CAP: Its History, Operation and Proposals for its Reform. The CAP: origins, objectives and principles. Instruments of the CAP: market organization schemes and structural measures. The dynamics of the agricultural sector of the EU during the 1973-90 period. The CAP under siege. Four perspectives on reform and future of the CAP. Implications for the design of a policy model on EU agriculture. Welfare Analysis of CAP Reform: A Stylized Model. A stylized version of ECAM. Free trade. Interventionism. The bureaucratic perspective. Consequences for the perspectives on reform. ECAM: An Agricultural Model of the EU-9. Applied general equilibrium modelling. From stylized model to application. The agricultural supply program. The dynamic structure. Experience gained from ECAM. Annex 4A. Model Validation. Annex 4B. Data and Parameters of ECAM: An Overview. CAP Reform in the Bureaucratic Perspective: The MacSharry Reform and the GATT Agreement. 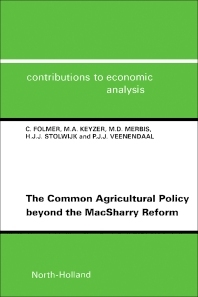 The MacSharry reform package: EU agriculture until 2005. What would have happened in the absence of the reform? CAP reform and the revised Blair House Agreement: compatible or not? The future of EU agriculture under the bureaucratic perspective: an assessment. Alternatives: Free Trade or Intervention? More free trade: the decoupled MacSharry scenario. More interventionism : the cartel scenario. The CAP until 2005. Implementation: financial renationalization of the CAP. The CAP in the long term. EU Agriculture in the Long Term: A Future as an Exporter? Background for a long term scenario. Long term prospects for world food supply and demand. The agronomic and technological ceilings for EU agriculture. Restructuring of the farm sector. A competitive EU entering the world market. More land used outside agriculture. Long run perspectives for agriculture in the EU-9: some tentative conclusions. Summary and Conclusions. References. Index. The reform of the Common Agricultural Policy (CAP) which is now being implemented, reduces the support for a selected number of agricultural products. This book uses welfare theory and applied general equilibrium analysis to assess the medium to long term consequences of this reform, if the new policies remain in place until the beginning of the next century. It analyses the implications of two alternative scenarios: a) a further trade liberalisation covering all commodities; and b) increased protectionism with high prices, constraints on production and export subsidies (financed by the farmers themselves). The study also investigates the implications of financial renationalisation, whereby the European Union member-states would cover the costs of their own support measures.